It could be tomorrow or it could be 10 years from now, but botanist Sean Blaney can all but hear the emerald ash borer knocking on New Brunswick’s door. Since it was first identified in North America 15 years ago, the Asian beetle has killed tens of millions of ash trees, according to Natural Resources Canada. Studies by the U.S. forest service show the beetle has the capacity to annihilate entire stands over six years with almost 100 per cent destruction. “Once it comes, it has the potential to take out a large percentage of our ashes, which is a significant portion of forest in many areas,” says Blaney, who works with the Atlantic Canada Conservation Data Centre. “It’s actually quite a beautiful looking insect, but the larvae feed in the living layer of wood and build up enough to cut off circulation. New Brunswick is home to untold invasive species that changed the ecosystem. Just how many invasive species reside in the province isn’t known. The government doesn’t maintain a database. But different groups across the province, such as the Petitcodiac Watershed Alliance, Nature Conservancy of Canada, Canadian Wildlife Federation and different branches of the federal government, have assembled lists. But just what constitutes a threat? The scientists the Telegraph-Journal spoke with, and the various invasive species catalogues researched, often differ in the threat level of different species. Many species hitch rides during global trade – the U.S. forestry service suspects the emerald ash borer was introduced to Detroit in the 1990s from northeast China via infested wooden packing materials. Other species have more unique introductions. Dutch elm disease came to North America with the importation of elm logs for veneer, according to government records. The European starling was part of a project to bring all of Shakespeare’s birds to North America, according to the Cornell Lab of Ornithology. “We’re never going to stop the spread of species around the world,” says Paula Noel with the Nature Conservancy of Canada in New Brunswick. Instead, Noel says the plan of attack involves slowing down invasive species via prevention, detection and management. “The more we can slow things down, it gives more of a chance for the natural environment to respond,” she says. There’s big demand for prevention initiatives, too. In the first five years of the federal government’s Invasive Alien Species Partnership Program, almost 800 applications were received asking for $39 million. The program ended up delivering just a fraction of that demand – $4.6 million. But only a small portion of that funding was awarded for New Brunswick. The province had the lowest percentage of the pie out of all provinces. Environment Canada, in a report issued in February, estimated that invasive species cost the country almost $30 billion annually. The Telegraph-Journal asked the provincial government for a New Brunswick estimate, but were directed instead to the Canadian Food Inspection Agency. Canada has set a biodiversity goal for 2020 to identify the way species enter the country and establish intervention or management plans for priority pathways and species. This is still a new concept. Noel says the nature conservancy has not examined how much time and money it spends on managing invasive species at its lands. Both Blaney and Noel say New Brunswick has staved off many invasive species because of its comparative lack of dense development and intact natural areas. It’s wilder, they say. And this is a natural prevention method for the spread of invasive species. But invasive species can grow exponentially. One invasive replaces several native species. Which leaves the area susceptible to other invaders. Noel says she’s increasingly seeing the impact of invasive species. She hopes that’s just because she and others are more focused on the issue than years before. The Petitcodiac Watershed Alliance has identified chain pickerel in its system. The Maliseet Nation Conservation Council states it was in several other waterways, too. The fish was introduced to our waters and is promoted for fishing by the province. But a Nova Scotia government study found it reduces other species in number and volume. It uses its large, duck-billed mouth of sharp teeth to ambush other creatures, such as Atlantic salmon smolts in Nova Scotia. Turn over any rock along the Fundy coastline, and you’ll likely find a European green crab, says Rebecca Milne, lab supervisor at Huntsman Marine Atlantic Reference Centre. A hundred years ago that wasn’t the case. There used to be rock crabs, lobsters and other species that have fallen prey to the more aggressive pinch of the green crab. Milne says the creatures are suspected of feeding on juvenile species. They also destroy habitat, reducing fish and shellfish diversity. Fisheries and Oceans Canada suspects the green crab came to North America from Europe and North Africa around 1817 in the holds of wooden ships. They were first found in Canada in 1951, in New Brunswick. “They’re just everywhere,” says Milne. “Short of engineering a biological control, they’re here now.” According to the government, the crab is one one of the world’s Top 10 unwanted species. The New Brunswick Alliance of Lake Associations calls this plant infamous. It lines the shores of the Saint John River, reducing and displacing native plants, birds, invertebrates and changing the ecosystem. It’s also notable that other invasive alien species have been used in attempts to control it. Various weevils have been brought to Canada to control the loosestrife. The first confirmed case of a bird with west nile virus in the province was in 2003, a year after the first human case was documented in Canada. The virus, which often has no effect in humans, but can cause symptoms from a fever to a central nervous system infection. It’s fatal to birds. First noticed in Uganda in 1937, it has spread globally. Mosquitos spread the virus between birds and, rarely, people. A provincial study in 2002 and 2003 found 20 mosquito species in New Brunswick that could transfer west nile. 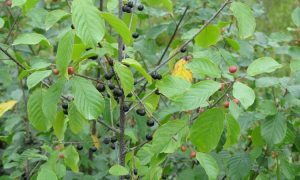 Beloved by birds for its abundant fruit, this shrub uses that to its advantage to spread rapidly. In open space, says Sean Blaney, it can proliferate and prevent sun from reaching other young trees. The Nature Conservancy of Canada classifies this as the most troublesome invasive plant species in New Brunswick. It is a product of ornamental landscaping gone wrong. Although playfully called sea squirts for their habit of retracting when touched and squirting, these invertebrates have a big impact. New Brunswick has been hit with vase tunicates, from northern Europe, and club tunicates, from the western Pacific ocean. According to Fisheries and Oceans Canada, they release more than 10,000 eggs by the time their eight to 10 years old, and live for one or two years. In our waters they compete for food and replace native species, and play havoc with shellfish aquaculture by growing on shellfish and underwater ropes, buoys, and cages.